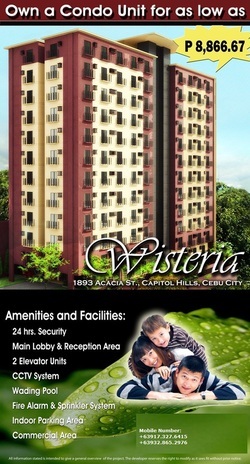 Wisteria Condominium is away from Mall’s, Government Offices, Business Establishments, Restaurants and Music Bars – All of this place are now within your finger tips. Finally, YOU'RE perfect address is now available! Please mention"WISTERIA CONDOMINIUM"with your comment in the comment box when you have inquiry.